It was one of the first warm days of Spring, and time to bring out the camera for child portraits. My niece was outside and the sunlight was stunning. I couldn't resist capturing the sweet smiles and laughter that afternoon as the kids played outside. My one niece helped me play around capturing portraits for a few minutes, as I had her flipping her hair in one direction and then another working on getting a perfect model pose. The backlight was awesome with her simply standing in my sister's front yard. Anyone who says that you can't make a beautiful portrait in the middle of the day in the harsh sun, needs to spend a little more time playing in the sun. All I really was interested in photographing was a beautiful relaxed moment with a sweet giggle in an unassuming pose, where she didn't even realize she was being posed. She'd flip her hair, I'd look at the images, and ask her to try again, changing my directions a little bit each time making her think we were working towards that perfect model hair flip pose. 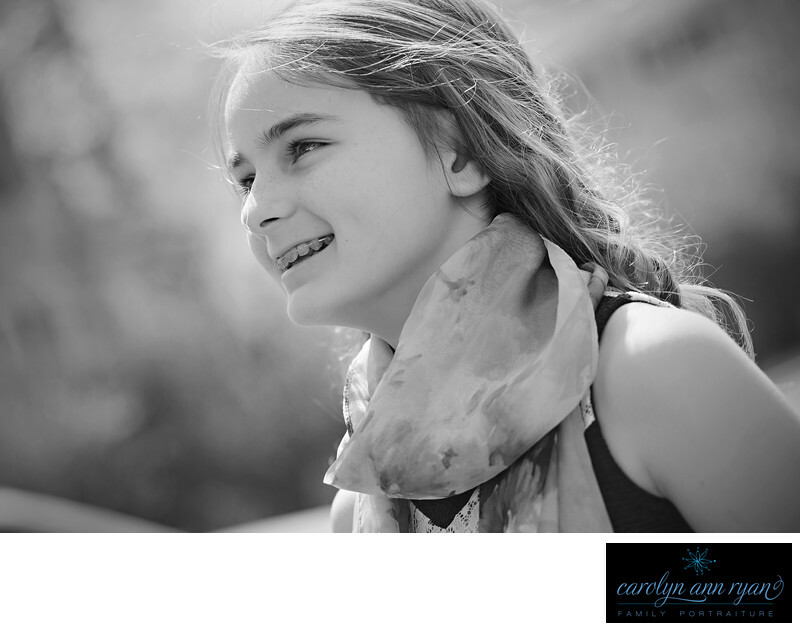 But at the end of the five minutesit was this photograph that I loved the most, that jumped out of the screen at me, and reminded me of the innocence of childhood even in those tween years.Keywords: b&w (51), black and white (54), braces (3), girls (165), scarf (9), Spring (48), tween (81). 1/640; f/4.0; ISO 100; 100.0 mm.